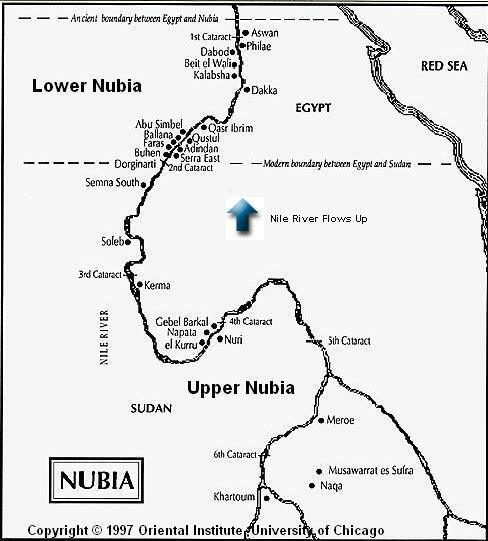 Kush was in iron smelting by seven thousand years from birth ..
Europe was asleep in a deep sleep .. these scientific facts ..
Around 1000 BC, following the collapse of the New Kingdom in Egypt, the Nubian kingdom of Kush re-emerged as a great power in the Middle Nile. Between 712-657 BC, Nubian kings conquered and ruled Egypt as the XXVth Dynasty. By about 300 BC, the center of the kingdom had shifted south to the Meroe region in central Sudan, where the pyramids and tombs were built to house the bodies of their kings and queens. These pyramids, often referred to as the Nubian pyramids or the Pyramids of Kush, were built to serve as tombs not only for the kings and queens of Meroe, but also for priests and high-ranking officials of Nubia who commonly had small pyramid structures placed on top of their graves. Due to the lack of archeological work in Sudan, only a few Nubian pyramids have actually been dated and explored. These pyramids are located in three different sites, totaling between 220 to 228 pyramids, which is more than double the total number of the ancient Egyptian pyramids; however the exact number of pyramids in Sudan (Nubian Pyramids) cannot be known since many have weathered away and are no longer identifiable. The oldest known Nubian pyramid is dated back to the eighth century B.C. This pyramid, located at el-Kurru, is identified as belonging to Pharaoh Piankhy (747-716 BC). Numerous differences can be identified between Egyptian and Nubian pyramids; Egyptian pyramids had their tomb-chambers cut within their pyramid structures, while the tomb chamber of the Nubian pyramids were dug under the ground, below the pyramid structures. Heights and steepness of the pyramids also differ greatly. The Pyramids at Nuri; located west of the Nile in Upper Nubia. This cemetery contained 21 kings, together with 52 queens and princes. Taharqa, the king of the 25th Dynasty was the first king to build his tomb at Nuri, and it is the biggest pyramid ever built at the site. Due to the reverse direction of the Nile there, Taharqa’s tomb [in Nuri], which is still on the “west” bank, paradoxically lay to the east, the place of sunrise and rebirth. Gebel Barkal, on the “east” bank, lay paradoxically to the west, the place of sunset and death. The tomb and the mountain, thus, symbolized creation, death and rebirth simultaneously. They were opposites, yet they were also the same. All of the opposites, in fact, were perceived to be united in Gebel Barkal and its pinnacle became synonyms: present and past, upperworld and underworld, living and dead, east and west, north and south, male and female, god and goddess, father and mother, parent and child, god and king, etc. The Pyramids of Meroe; between the 5th and 6th cataracts. During the Meroitic Period, over forty kings and queens were buried at Meroe. Forty generations of Nubian royalty are buried in Meroe, and every royal Nubian tomb is housed within a pyramid. The Meroitic South cemetery contained the tombs of three kings, Arikakaman, Yesruwaman, and Kaltaly, as well as six queens. Several hundred yards to the north, the Meroitic North cemetery held an additional 30 kings and 6 queens, successors of the South cemetery group. Their tombs, built under steep pyramids, were all badly plundered in ancient times, but pictures preserved in the tomb chapels tell us that the rulers were mummified and covered with jewelry and laid in wooden mummy cases. The larger tombs still contained remains of weapons, bows, quivers of arrows, archers’ thumb rings, horse harnesses, wooden boxes and furniture, pottery, colored glass and metal vessels, and other things, many of them imported from Egypt and the Greek and Roman worlds. Meroe belongs to the most important monuments of the beginning of civilization on the African continent. Queen Bartare (260-250 B.C.) was the last monarch to be buried in Meroe. All the tombs at Meroe have been plundered most infamously by Italian explorer Giuseppe Ferlini (1800-1870) who smashed the tops off 40 pyramids in a quest for treasure in the 1820s. Ferlini found only one cache of gold. His finds were later sold, and remain at the museums in Munich and Berlin. The Pyramids of el-Kurru; The first Nubian pyramids were built at the site of el-Kurru. The site at el-Kurru contains the tombs of King Kashta and his son Piye (Piankhi), five earlier generations, together with Piye’s successors Shabaka, Shebitqo and Tanwetamani and 14 pyramids of the queens. With the finished construction of the Aswan High Damin 1968, and the flooding of the Nubian homeland, the last of the Nubian people were forced to leave the area that extended south along the banks of the Nile from Aswan in the north to the Sudanese border 290 miles south. Unfortunately, the likelihood of further archaeological study at any sites in Nubia is all but impossible because many of the primary areas of investigation now lie under 250 feet of water, at the bottom of Lake Nasser. Over 150,000 Nubians and Sudanese were forced to relocate off the land their ancestors had called home for over 5,000 years. 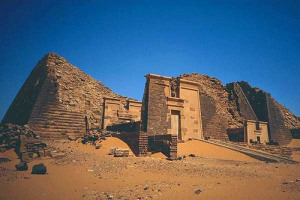 Over 45 Nubian villages were washed away along the banks of the Nile south of Aswan. There is no way to estimate the total number of temples and tombs which now lie at the bottom of Lake Nasser, nor is there any way of knowing the many secrets these structures currently hold. Because of the creation of the Aswan Dam, the world will never have an opportunity to study the full impact Africans from the southern Nile Valley had on the development of ancient Egypt and subsequent civilizations. Additionally, in our current times, theft is an ongoing problem that threatens the preservation of the treasures hidden within the pyramid sites. A number of international preservation organizations and academic institutions, with minimum support from the Sudanese government, are struggling to maintain and insure the security of the country’s valuable historical sites that form an essential part of the global human heritage. About 1450 BCE, the Egyptian pharaoh Thutmose III extended his conquests to Gebel Barkal and established it as the southern border of his empire. The city he founded there was called Napata. The Egyptians remained only about 300 years. Later Napata became the seat of royal authority of an independent Nubian kingdom called Kush, and from about 720 to 660 BCE its kings conquered and ruled Egypt as the 25th Dynasty. Napata was the political capital of Upper Egypt (northward to Memphis) during the late-8th-century reign of Piyankhy (or Piye). After the Kushites were driven out of Egypt, Napata continued as an important royal residence and religious center until about 350 BCE, when the kingdom finally collapsed. To date, we know of three successive kingdoms of Nubia (aka Kush), each with its own capital: the Kingdom of Kerma (2400-1500 BC), that of Napata (1000-300 BC), and finally that of Meroe (300 BC-300 AD). If you’re planning to visit the Nubian Pyramids of Sudan, here are a few personal guidelines. If you’re non-Sudanese, make you sure you check with the Sudanese Embassy in your country in advance for the Visa requirements and how long it might take. Visiting the Meroe site is the easiest. It’s only about a 2 hour drive north of Khartoum. There’s an “Italian” tourism agency that can provide you with a driver that can take you there, they will also book a room for you at a camp-like hotel which is right opposite to the site. I would highly recommend spending a night there and enjoy the peace of the site at night. The Nuri site is within the city of Kareema. The same tourism agency can also provide you with day trips there. It’s about a 3-4 hour drive from Khartoum. If you prefer not to take the Tourism Agency trips, make sure you take a driver who knows the way. Most of these sites are about 15-30 minutes off-road. Make sure you plan everything ahead of your trip there and also keep in mind changes in plans are inevitable in Sudan.